Now that the E3 excitement has tapered off to a thin adrenal wisp, I’ve had a chance to gather together all of the most interesting Call of Duty announcements and shouty trailers online. If it happened in the last week, and it had something to do with Call of Duty, it’s right here. Treyarch assuaged PC concerns right out of the gates, announcing that the PC version of Black Ops 2 will be the prettiest, running as it will on DirectX 11. The dev also confirmed that we’d be able lean (both to the left and to the right) as well as change our field of view. Fully three new Black Ops 2 screenshots arrived showing off some exceedingly good sparks and drones. ‘Sparks & Drones’ is also the name of my work-in-progressmismatched comedy detective drama. Bonus fact, these screenshots were sent to us as at the baffling resolution of 6400×3600, so it’s fair to say there weren’t running the thing on a Playstation. 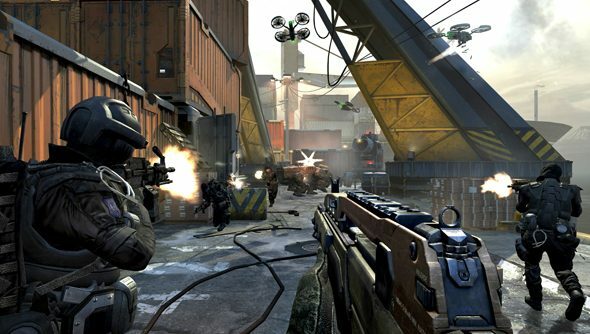 Call of Duty XP won’t be coming back in 2012, The Verge were told. The convention ran last year and showcased Infinity Ward’s Modern Warfare 3 with a million dollar gaming tournament. There was also paintball. “While its possible we may host another XP in the future,” claimed a tongue and mouth belonging to Activision, “we don’t have plans to hold the event this year.” Sorry Black Ops 2, you sequel to the best-selling game of all time, you. The ten minute long gameplay video shown during the Microsoft conference contains an imperilled lazy-prez, a sniper rifle that can see ghosts (unless I misunderstand) and, most excitingly, a section where you can fly around in a near-future VTOL fighter jet. Treyarch have got this sort of thing down to an art. A Black Ops 2 behind the scenes vid discusses some of the finer points of Treyarch’s development process, paying particular attention to motion-captured horses. I sometimes wonder if the horses like having mo-cap ping-pong balls affixed to their flanks? I hope you aren’t confusing those horses, Treyarch. Bluth brothers Will Arnett and Jason Batemen trail their upcoming, Call of Duty Elite-exclusive comedy shorts, titled Cocked Hammers. What do you make of it, given that this is something you might be paying for? It’s certainly… well, it’s certainly a video of those men we just mentioned. Nobody can argue with that.